DIETING MAY WORK for weight loss but does it help with oral health? Topping the list of many people's priorities is weight loss. We are currently living in the era of egotism and excess where over-consumption of food has nurtured an increasing obesity epidemic and an equally but opposite repercussion as people attempt to drop the resultant weight. Every day is seemingly greeted by new and trendy diets in every niche: gym diets, carb diets as well as no carb diets.There are diets that are recommended by celebs and their personal nutritionists and trainers. Diet can impact oral health through various mechanisms. Nutritional deficiencies can trigger numerous ailments which manifest as oral changes. People are taking various fad diets and shortcuts to get slim, often overlooking moderation.You need to be aware that your diet does not just affect your weight and physical health but your dental health as well. Our eating habits can have a positive or negative impact on our dental health. Furthermore, while certain foods are beneficial, they are capable of causing disease, possibly affecting not only the teeth but also periodontal structures plus mucosa. Lemon squeezed into warm water is an excellent detoxifying drink but can erode your enamel due to the citric acid. Popular weight loss diets use a mixture of juices and milkshakes to help people shed those extra pounds. There is one problem you probably have overlooked: the quantity of sugar in these juice cleanses or the milkshake regimens. 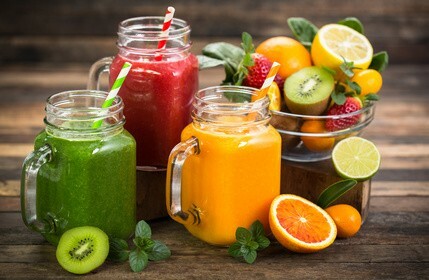 Although the standard acidity levels in fruits and vegetables are fine, your teeth can be damaged by the high concentration of sugar in juice cleanses. Meal replacement shakes are a healthy and easy alternative to processed foods. They keep you full for longer periods as they contain high protein and are low in calories. These shakes may often lead to tooth decay due to high levels of sugar in the shakes and consequently, the need for dental procedure. Bad breath due to high protein diet Diets that contain high protein aimed at cutting out carbs may as well have harmful effects on your general health and well being. Protein-rich diets can lead to ketosis which is a chief cause of bad breath. Green tea is one of the favorite beverages of those who want to grow slim. It is packed with antioxidants and is fat-free, of course. Overconsumption should be avoided as green tea can stain your teeth. Consuming raw foods including fruits and vegetables, seeds and nuts is good and healthy for you. However, when you consume a complete raw food diet only, a couple of issue will arise. Most of the fruits are loaded with organic sugar. Moderate consumption is not harmful any day. But an exclusive diet on raw fruits can increase the sugar load on teeth thereby, putting them at a risk of developing dental decay. As a healthy person, it is crucial to be aware of what you are eating and also how it may impact on your overall health. While losing weight and getting healthy is certainly great, it should not come at the expense of your dental health. WHY YOU SHOULD CLEAN YOUR TONGUE?